Shambrishia Jones appreciates her family more than words can say. She knows what a blessing they are, because she knows what it is like to be separated from your family and not have a place to call home. In 1990, nine-year-old Shambrishia, her sister and brothers were placed in foster care. While she admits foster care may have taken her out of a dangerous situation, it also struggled to provide stability. None of the homes could accommodate her whole family, so she kept being separated from her sister and brothers. “All the foster homes that we stayed in were short term — some were for a year, for others it was only months until we had to move to a different (foster) home and begin again,” said Shambrishia. 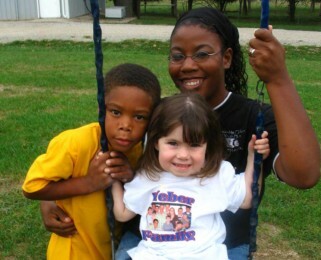 After graduating from high school, Shambrishia attended Ozark Christian College, and then returned to Show-Me to provide daycare for the little ones and serve as a relief houseparent. Miss Brishia is still remembered for her big smile, contagious laughter, joyful spirit, and a hug for all the children that spent time in her home. “I wanted to show each of these kids the love of God just as I experienced it growing up here,” she said. In 2008, God spread that love across the United States when she married Derrick Jones and moved to Maryland to start a family of her own. Their family grew and now includes a daughter, Alayna. Miss Brishia continues to help children at a local public school as an Additional Adult Assistant for children with autism.